Air Level Master™ with SS Bracket | Lafferty Equipment Manufacturing, Inc. 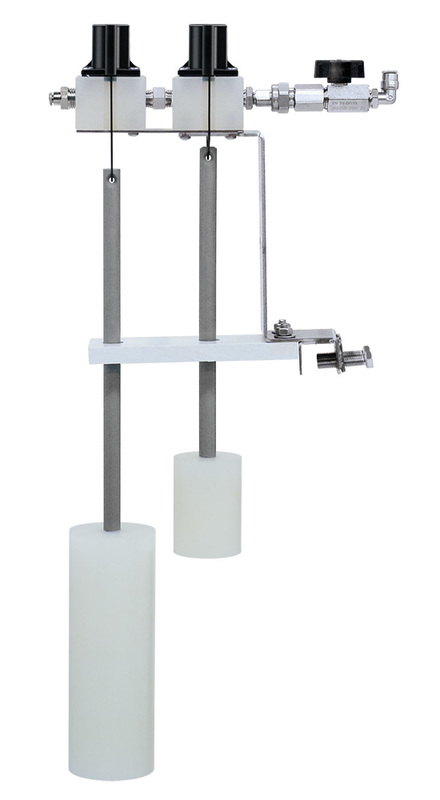 The Air Level Master™ with Stainless Steel Bracket is a float valve system that clamps to the rim of a user-supplied day tank and regulates the activation of Satellite Mixing Stations (sold separately) to automatically maintain a constant supply of ready-to-use chemical solution. When the solution in the tank drops below a pre-set level, the primary float valve will open to allow compressed air to flow through and activate one or more Satellite Mixing Stations to quickly replenish the solution. The system cycles continuously and a secondary fail-safe float prevents overfilling.